Five-hundred and sixty-two Dickinsonians from 31 states and 15 foreign countries transitioned from students to alumni during a Commencement ceremony that included two impassioned calls to action, a high-profile award and the bestowing of four honorary degrees. And while spring rain and threatening thunderstorms forced the ceremony indoors, it did not prevent the class of 2015 from taking that time-honored walk down the steps of Old West. Associate Professor of Music Amy Wlodarski also was named by Class President Cassandra Colburn (policy management) as the 2015 recipient of the Constance & Rose Ganoe Memorial Award for Inspirational Teaching. Kimberly Drexler (art & art history, French), who will pursue a career in art law after serving a fellowship at the Guggenheim Museum, received the James Fowler Rusling Prize for scholarly achievement. Kirsten Dedrickson (philosophy, computer science), who will attend Stanford Law School in the fall, was awarded the John Patton Memorial Prize for high scholastic standing. Frank Williams (Africana studies, law & policy) and Kayla Muirhead (biology) received the Hufstader Senior Prizes, awarded annually to the senior man and senior woman who have made the greatest contributions to the good of the college. Williams will take a gap year before pursuing a law degree, and Muirhead has accepted a position with the National Institutes of Health as an intramural research training awardee, with plans of pursuing a Ph.D. in genetics. Muirhead, who participated in many student-leadership roles at Dickinson, also was announced as the 2015 Young Alumni Trustee, an honor that carries with it a two-year term on the college’s Board of Trustees. The Sam Rose ’58 and Julie Walters Prize at Dickinson College for Global Environmental Activism was presented to actor/environmental activist Mark Ruffalo. The award recognizes Ruffalo for his work promoting sustainability, as co-founder of Water Defense, an advocacy group that works to create better access to clean water by testing water supplies and documenting contamination. William Wallace ’74, an art-history professor and internationally recognized expert on Michelangelo, was presented with an honorary doctor of fine arts degree, and Ann Conser Curley ’63—a journalist and former president of Dickinson’s Alumni Council who co-established three chairs at Dickinson, along with husband John Curley ’60—was awarded an honorary doctor of liberal arts degree. The college awarded a posthumous honorary doctor of philanthropy degree to John “Jack” Stafford ’59, who, along with wife Inge Paul Stafford ’58, also made possible many scholarships and additions to the college—most recently, the Dr. Inge P. Stafford Greenhouse for Teaching and Research, dedicated in 2013. Jack’s four daughters accepted the award on his behalf. Ian McEwan, the award-winning author of more than 20 novels and short stories, including Atonement (2002), was awarded an honorary doctor of letters degree, and he delivered the Commencement Address. McEwan, who first visited Dickinson in 2005 through the Harold and Ethel L. Stellfox Visiting Scholars and Writers Program, spoke about the need to preserve and promote free expression in the wake of recent global events, such as the January attacks on the offices of the French satirical newspaper Charlie Hebdo. Then came the moments the 562 members of the class of 2015 had long been waiting for—the conferring of degrees. 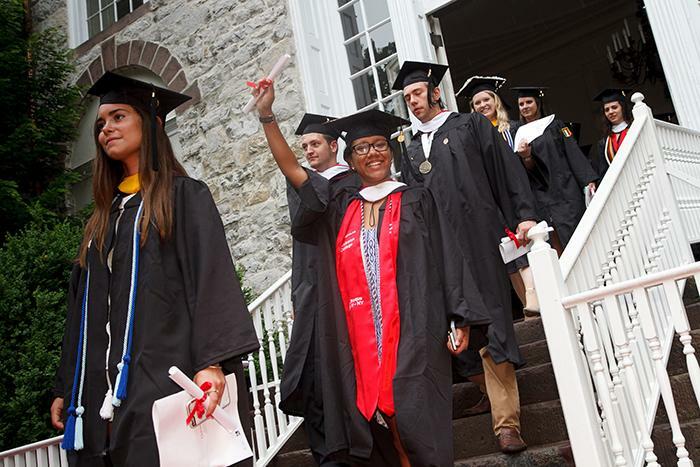 After the graduates were recognized, the class processed from the Kline to Old West, so they could walk down its storied stone steps—a tradition that mirrors their ascent of those steps when they were officially signed in to the college, nearly four years ago. "Saluting the Class of 2015"